Fellow The Diplomat writer Richard Weitz rightly observes that military-to-military contacts between the United States and China may reduce the chances of misunderstandings in times of duress but can’t resolve clashes of basic interests and worldviews. Which raises two questions. What can military leaders hope to learn during face-to-face visits or talks? 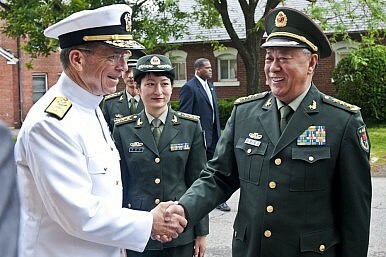 And what could US Joint Chiefs Chairman Michael Mullen or Chinese General Staff Chairman Chen Bingde learn about a prospective opponent that would set their minds at ease about the likelihood and ramifications of US-China conflict? In short: that the potential adversary has no desire to pose a threat to one’s interests, or that it’s incapable of posing a threat. Strategic theorist Carl von Clausewitz offers insight into this, as into most matters relating to diplomacy and warfare. First, Clausewitz breaks down national strength using a simple equation, portraying it as a product of force and will. We might go one better and break down ‘force’ into hardware—weaponry and platforms—and the software, namely soldiers, sailors, and airmen expert at using arms. Second, he counsels statesmen and soldiers to ‘discover’ how many resources and how much time a given enterprise will demand by examining the strength and situation of the contenders, the capacity of the contenders’ governments and peoples, and the likely sympathies and actions of third parties. A formidable opponent is a hard nut to crack, demanding efforts of substantial magnitude and duration. The likely gains may not be worth the expenditure of lives and finite resources. Standing firm against a less formidable opponent is more affordable, and thus more politically and strategically palatable in Clausewitzian terms. Strong nations, in other words, boast physical capability along with the skill and resolve to use that capability to attain political and strategic goals. It takes all three elements to constitute a threat. US or Chinese officials would take comfort from face-to-face meetings if they came away convinced their prospective adversary lacked for capability, skill and élan, or resolve. It would pose little danger until it corrected the weaknesses thus exposed. If either contender is short of one element of national strength, then, the prospects for amicable working relations should brighten. Of these pillars of national power, capabilities—ships, tanks, aircraft, and so forth—are the easiest element to measure. The late Michael Handel points out that it is natural for intelligence services to measure what they can measure, such as numbers of assets and their technical specifications. This provides a rough benchmark of combat potential. An opponent with inferior numbers or quality of hardware presumably presents few hazards. Yet there are pitfalls even to this bean-counting approach to gauging military power. Armed forces may try to disguise their capacity to lull opponents into a false sense of security. And indeed, the Chinese defence industry has sprung any number of surprises on Western intelligence agencies over the past decade, ranging from indigenous diesel- and nuclear-powered attack submarines to high-tech destroyers to stealth combat aircraft. It’s also easy to overlook the home field advantage a regional power enjoys over even stronger yet faraway antagonists. Vast distances attenuate military power, if nothing else by straining an armed force’s logistical capacity. Imperial Japan hoped to whittle the US Pacific Fleet down to size by stationing tactical aircraft and submarines along a forward island defence perimeter. Japanese pilots and submariners aimed to even the score as a precursor to a decisive fleet battle somewhere in Asian waters. China too hopes to turn the width of the Pacific to advantage. In mounting a ‘contested zone,’ the People’s Liberation Army (PLA) can exploit such advantages as nearby bases, plentiful manpower, short distances to the combat theatre, and familiarity with the physical and cultural terrain. If PLA commanders play their hand skilfully, Beijing could get its way in a crisis despite overall inferiority to its chief rival. It’s doubtful either US or Chinese military commanders come away from military-to-military contacts confident in their supremacy over the most likely antagonist. The PLA understands that it must play catch-up against a superpower of decades’ standing. The US military is conscious of economic malaise, the coming financial stringency, the upward spiral in the cost of new weaponry, and multiple commitments across the globe. Neither side can be entirely sure of its capacity to concentrate superior force at any point on the map of Asia at any given moment. So even the easy part – tallying up assets and capabilities – isn’t as easy as it appears. What about skill, the human factor in military operations? Here the chore of estimating another nation’s strength gets even blurrier. Sizing up the US military is relatively straightforward, simply because US forces have been deployed in multiple theatres for the past decade. Evidence is available. The US Navy takes pride in always being on a wartime footing at sea, even in peacetime. Drills and exercises abound. The only real difference is whether navy units expend live or dummy ordnance. PLA ground, sea, and air forces keep up a far slower operational tempo than their US counterparts, making it harder to judge how well PLA personnel handle themselves under stressful circumstances. My guess is that inexperience typifies day-to-day PLA operations. In combat, as in sports or any other endeavour, you have to practice to play well. But there’s no way to reach firm conclusions without hard evidence. There’s a perverse aspect to this. Writing in the late Cold War, scholar Edward Luttwak pointed out that open societies like the United States – including their armed services – habitually air their dirty laundry in private, whereas closed societies like the Soviet Union and China take extravagant measures to manage their images. Luttwak noted that the US military beat itself up in the press about its deficiencies – the Soviet military, not so much. This cast a false impression of US military decline and Soviet military ascendancy. It turned out that the Soviet Navy, for instance, built impressive-looking vessels, yet maintained them poorly and never attained seamanship or combat proficiency on par with Western fleets. False perceptions, then, can come from operating practices. Military-to-military contacts often feature inspections of static platforms like aircraft and ships. They do little to dispel misperceptions about how these platforms and their operators would perform in battle. And then there’s political resolve. Clausewitz notes that senior officers do their work at the interface between policy, strategy, and operations, with the goal of yoking military power to the wishes of statesmen. Consequently, they seldom freelance on policy matters. They restate official positions, leaving high diplomacy to their political masters. But military-to-military contacts reveal clues of a mismatch between policy and strategy. A rival with ambitious policy goals backed by a well-equipped, combat-proficient military represents cause for concern. Modest or innocuous goals entertained by a rival would calm worries about future tension or strife – with the caveat that intentions, unlike force structure, can change overnight. Probably the worst case is an assertive interlocutor, overconfident in his military’s capacity to back up forceful diplomacy. The prospects for miscalculation and escalation rise when one – or worse, both – of the protagonists is ignorant of its own capacity to put steel behind diplomacy. How much one side can glean from – or convey to – the other about such matters in military-to-military forums, then, is far from clear. Let’s not exaggerate the importance of such contacts. Weitz is right to welcome ongoing US-China military contacts while throwing cold water on their capacity to ease fundamental conflicts of interest. Such exchanges help around the margins, but then their costs and risks are marginal as well. As far as fostering transpacific amity, that’s the work of statesmen. James Holmes is an associate professor of strategy at the US Naval War College and the co-author most recently of 'Defending the Strait: Taiwan’s Naval Strategy in the 21st Century.' The views voiced here are his alone.